Payable in cash only, this includes temporary membership and coaching for the session. Feel the sleek boat glide through the water underneath you, and enjoy being part of a team learning new skills. See Belfast from the river! You will use a rowing machine inside to learn the posture and grip to be used, and the sequence of muscles used during a rowing stroke. 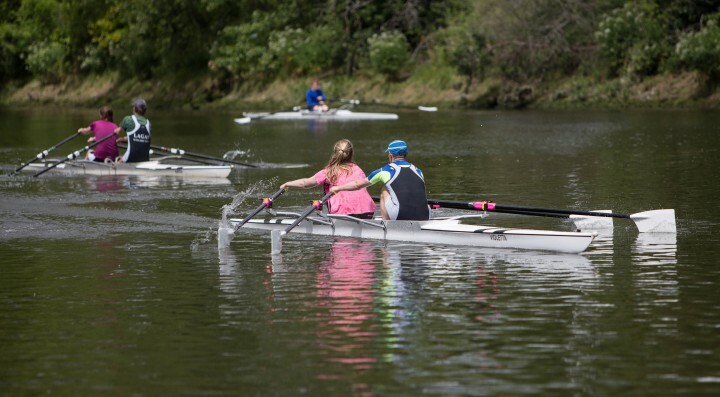 You will then be introduced to rowing on the water in a boat balanced by others, where you will learn to move the boat using the same sequence of muscles, as well as posture and grip. Please email name, age, mobile number for each participant, and preferred session to lscullers@hotmail.com by 7 May and await a reply to say you are accepted. You will receive a consent form to complete and bring. Under 18s will require parental consent. During the 90 minute session you will spend 10 mins on the rowing machine, 45mins in the boat rowing, and all 90 minutes learning! Boats and equipment are provided, along with coaching. No equipment needed. Wear t-shirt and leggings, not loose, and outer layers to suit the weather, and track shoes (not your best runners). Bring a kit bag with a bottle of water/diluted cordial, towel and change of clothing. Minimum age 16, maximum weight 100kg. You need to be confident around water and be able to swim 50 meters in clothing. We do not wear buoyancy aids.